Backing up data on your computer is important and most users know this. Windows features a backup utility that allows you to backup your system and files. This is a useful utility but sometimes you might find that it does not completely backup your files or an error occurs. If you need to backup your files to an external hard drive urgently and you don’t have the time to deal with errors and Microsoft Help, you need another backup program. Rest assured that you do not have to come out of pocket to get a backup program up and running quickly. You can deal with errors in Windows Backup later. Right now, you need to get files on the hard drive in a format that can be easily restored. Many backup programs have been reviewed here. 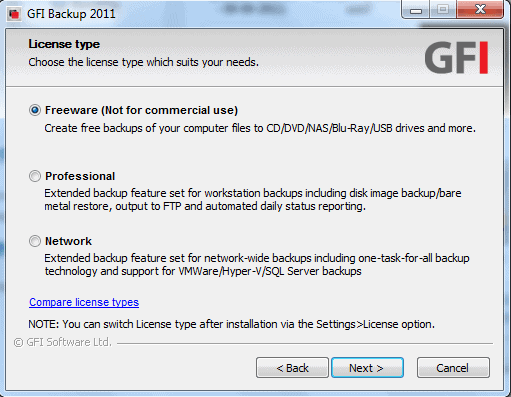 This article demonstrates how to use GFI Backup Free Edition in lieu of Windows Backup. Download GFI Backup Free Edition from this link. With GFI Backup 2011, you can back up essential documents, pictures and videos, music, e-mails, and program settings. This is all done through a user friendly GUI. It will backup data to local and external drives, CD/DVD, remote FTP servers, and other removable devices. To use the Freeware version, during setup you will have to check the circle next to “Freeware” and then click Next. Then you will have to agree to the terms and conditions which include agreeing that you will not use this version for commercial use. You will enter your Username, password, and Domain. If your computer is on a Workgroup, you do not need to enter the Domain. GFI Backup uses two GUIs. The first, pictured in the above screenshot, is the GFI Backup Agent. This is for standard backups and is fairly easy to use. For advanced network backups, you can use the Administrative Console, the second GUI feature. For this demonstration, the Agent will be used. 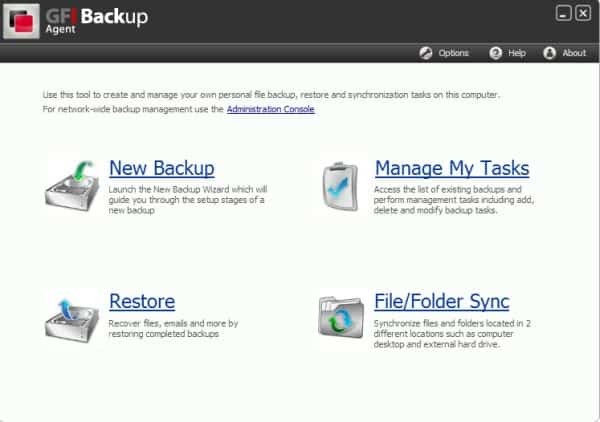 Click on New Backup to get started. 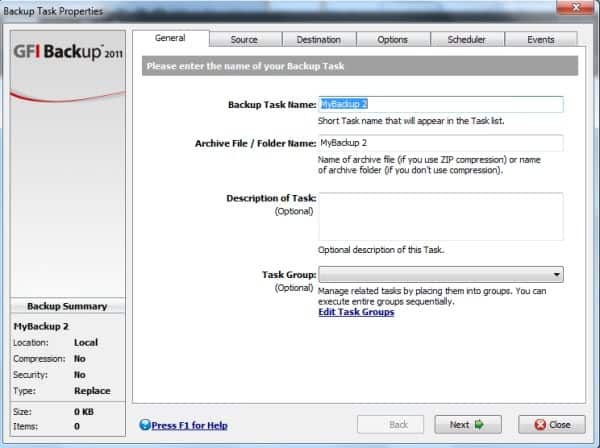 You can provide a name for the backup in the “Backup Task Name” box. By default, the backup will be named “MyBackup 1 (2, 3, etc. )” You can leave the default name or make up your own. There is an option to enter a description of the task and group related tasks. For basic purposes, leave these fields blank unless you need a description attached. Click Next to move on to the next step. Now you select the source. You can backup Files and Folders, Registry Keys, and Email. Files and Folders are selected here. This will allow you to specify which files and folders on any given disk(s) for backup. Click OK and Next to move on to selecting the destination. If you do not know the destination path of your external hard drive, you can find it on Computer in the Control Panel. In this case, it is drive (M:). Next you will choose your options and then scheduling. You may run it only once or schedule it for regular intervals. In the Events panel, you should probably leave the default settings. Click Next and the backup begins. Depending on the size and number of files and drives selected, the duration of the backup varies. You should minimize the window and complete other tasks or go take a long break because it is going to take awhile. Now you don’t have to worry, your files are being safely backed up. But how to restore? and restore a single or a few files? I made a backup with gfi and it completed okay but all files in te task are listed red and cannot select restore.